Please follow the procedures for AM drop off and PM pick up. 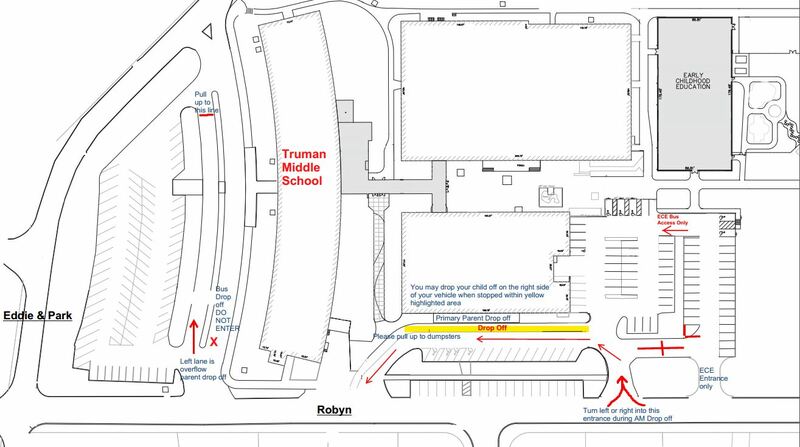 We will continue the additional parent drop off in the front of the building, which seemed to alleviate traffic backing up beyond the four-way intersection at Robyn and Eddie & Park. Please be sure to follow the traffic flow pattern as shown. Notice that the front of the building is a one-way traffic flow. If you are dropping off your students in any of the AM parent drop off areas and need to help your child, please find a parking place not in the traffic flow.